November 7, 2018 / Modified nov 7, 2018 11:38 a.m.
Gov. Doug Ducey speaks at an event on the eve of the election, 2018. Behind him are Martha McSally and Jon Kyl. The race for Arizona governor was clear early in the night. Republican Gov. Doug Ducey will serve another four-year term. Ducey was pulling ahead in the polls for a few weeks, but for a time, he and Democratic challenger David Garcia were in a closer race. They spent the campaign cycle debating education funding strategies and education's role in the state's economy. But as election day neared, polls showed Ducey was on his way to a victory, which voters determined early on in the vote count last night. When he claimed victory, Ducey said he wants to do more work on education funding, economic development and public safety. Those issues were central to his first term and his re-election campaign. 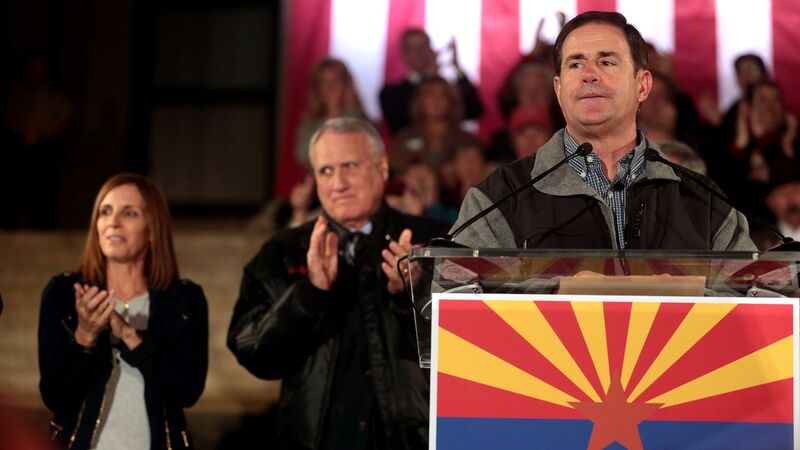 Ducey helped shepherd a raise for Arizona's teachers earlier this year, and Garcia campaigned on more funding for schools and teachers, saying Ducey didn't go far enough. Ducey's second term will run through 2022. Gov Ducey Lays Out Agenda in State of the State Speech Previewing the 2020 Election As the Colorado River Basin Dries, Can an Accidental Oasis Survive?